Vote-buying is a widespread electoral practice in developing countries that may undermine the accountability of elected officials, especially to the needs of the poor. In order to diminish the effect of bribes on voter behavior, researchers designed and evaluated a non-partisan anti-vote-buying radio campaign during the 2014 Indian general election. Using electoral data, researchers assessed whether voters in areas that were randomly assigned to receive the radio campaign became less likely to vote for the reputed vote-buying parties. Elections are designed to make political leaders accountable for their performance and responsive to citizen demands. The monitoring function of elections is particularly important in developing countries, where formal watchdog institutions play a limited role. Vote-buying may constrain economic development through under-provision of public goods such as education, public health, and infrastructure. Further, since the poor are the primary targets of vote-buying, it may also undercut their political voice. Vote-buying remains prevalent even though almost every country uses the secret ballot, which means that parties cannot ensure that the voters they pay off vote "correctly." Vote-buying could still be effective in the presence of the secret ballot, however, if it appeals to voters' intrinsic feelings of obligation to reciprocate a gift from a political party or candidate. Educating voters about the hidden social cost of voting for vote-buying parties could make vote-buying less effective. This evaluation is the first to test the effect of anti-vote-buying radio messages. 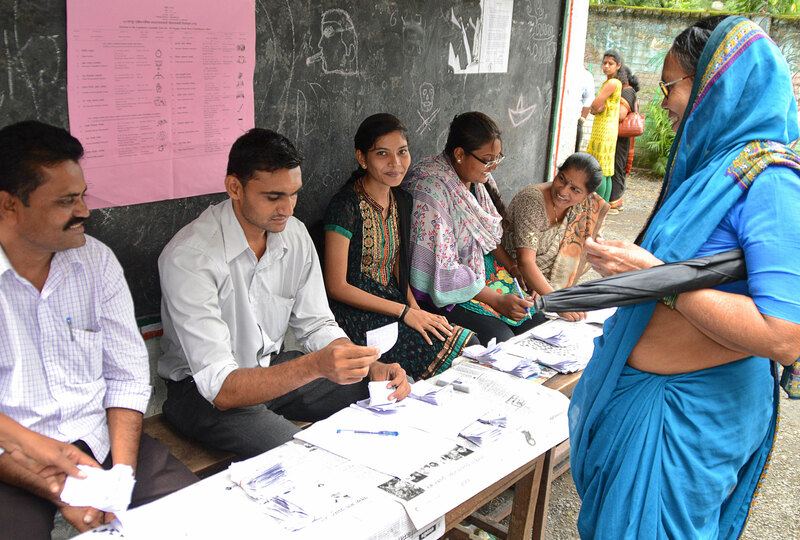 The 2014 India general elections to elect state assembly members and national Parliament members took place between April 10 and May 12; exact polling dates varied from place to place. Official rules prohibit campaigning in the 48 hours before polling begins, but researchers were permitted to broadcast non-partisan anti-vote-buying messages through All India Radio (AIR) stations during this time. AIR, also known as Akashvani, is the national public radio broadcaster of India. AIR' s transmissions cover 95 percent of the country by area and 99 percent by population. In comparison to other media sources, AIR has the highest audience reach in rural areas with high rates of poverty and illiteracy, which are also the areas most likely to experience vote-buying. Researchers tested the effect of an anti-vote-buying radio campaign on voter turnout and the vote share of the top vote-buying parties. Researchers followed election outcomes in constituencies covered by 60 of AIR' s 194 radio stations in 10 states. They focused on stations serving rural areas where the local language was Hindi, Kannada, Marathi, Odiya, or Telugu, and did not work with stations with high power transmitters or high advertising costs. The 60 radio stations were randomly divided into either a treatment group, which received the anti-vote-buying radio campaign, or a comparison group. Researchers produced three 60-second spots in each of the five languages. Each radio spot consisted of a satirical vignette about the hidden social costs of vote buying. The radio spots highlighted the incentive of vote-buying candidates to earn returns on their "investment" on getting elected. The vignettes portrayed the inconsistency between the vote-buyers' election promises to provide public goods and their anticipated future corrupt behavior. The message ended with an appeal to teach vote-buyers a lesson by voting for an honest candidate. Stations in the treatment group aired each of the three spots in the two days before the election and on the election day. In order to determine which parties most often engaged in vote-buying, researchers interviewed around 400 local journalists in 10 states. Parties reported by local journalists as engaging in vote-buying in a given state were labeled as the vote-buying parties of that state. Researchers then used official election returns to compare voter turnout and voter share for the vote-buying party in state assembly constituencies covered by treatment and comparison radio stations. Researchers are still analyzing data for a complete analysisall results reported below are preliminary. Preliminary results suggest that the anti-vote-buying radio campaign reduced the vote-share of the vote-buying parties significantly and had a weak negative effect on voter turnout. Green, Donald, and Srinivasan Vasudevan. "Diminishing the Effectiveness of Vote Buying: Experimental Evidence from a Persuasive Radio Campaign in India." Working Paper March 2018.